A lot of cruising boat owners would love to race their boats, but find “crew wrangling” more trouble than it’s worth. Spending days on email or the phone to recruit a full crew is a drag…not to mention the food and bar bills that come with having eight to ten crew on the rail. Then there’s the grousing about being railmeat with not enough to do. Adam Loory, a member of Huguenot Yacht Club and General Manager of UK Sailmakers in City Island, NY, came up with a solution to this problem: Plus-One divisions. 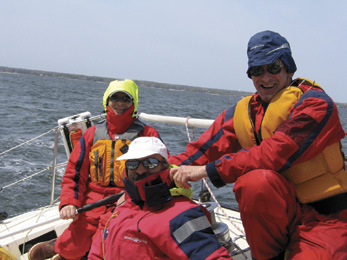 Realizing that double-handed sailing has become the rage (it can be more challenging, and those owners have a much smaller crew to wrangle), yet recognizing sailing with only two may be too steep a hill to climb, Loory’s concept is to limit crew to approximately half a boat’s normal crew headcount. Erring on the smaller side, the formula is simple: take the tens digit of the boat’s length and add one…Plus-One. 20’-29’ LOA = three crew; 30’-39’ = four crew; 40’-49’ = five crew, etc. No more railmeat, lower crew expenses, and more fun on the course for everyone. Larchmont YC’s annual Edlu Race, a 32-mile sprint on May 10, will be the first regatta to offer a Plus- One division for scoring purposes. If enough boats enter as Plus- One, the club has said it could even offer two separate Plus-One divisions. If the concept of kinder, gentler crew management appeals to you, enter this year’s Edlu Race at YachtScoring.com. For all other questions, email LYC’s race committee at RaceCommittee@LarchmontYC.org. Maybe your club should consider adding Plus-One for its next regatta, as has Stamford Yacht Club for its Double- Handed Regatta on May 31 & June 1 (also taking entries via YachtScoring.com).